If you need a new graphics card for 1080p gaming and are looking for a lot of bang for your buck, AMD's Radeon RX 470 is right up there (check out our bang-for-buck comparison to see how it fares against other cards). Even better is when one of these cards goes on sale, as is the case with MSI's Radeon RX 470 Armor 4G OC. 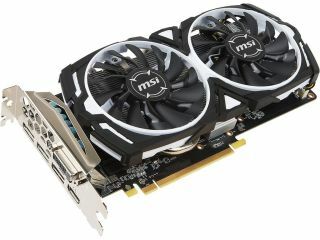 For today only, Newegg is offering the card on sale for $160, a savings of $25 from its normal selling price. A $20 mail-in-rebate knocks the price down even further, bringing your tally to just $140. And to sweeten the pot, it comes with a coupon code to download Hitman for free. MSI's Armor edition card sports a black and white cooler with two fans. They're completely silent when the card is idle and only spin up when temps rise above 60C. Underneath is a massive heatsink with heatpipes squirreling through. The card is factory overclocked, though MSI didn't go crazy here—it features a 1,230MHz boost clockspeed, which is 24MHz faster than AMD's reference blueprint. That minor bump isn't reason alone to consider this card, though it's a nice perk at this price point. Go here to grab this card.